An AMAZING Movie That ‘Society’ Does NOT Want You To Watch! 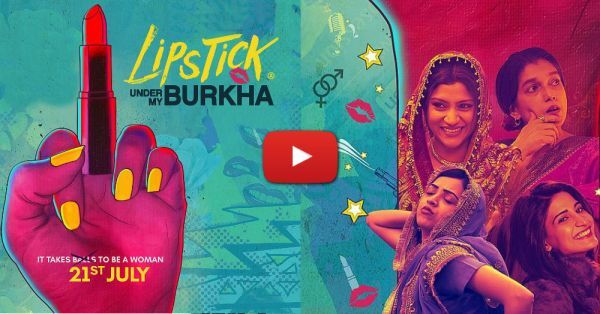 The new trailer of Lipstick Under My Burkha is out and it’s from a section of society which everyone ignored but shouldn’t have. After the endless controversial stretch with Pahlaj Nihalani, chairperson of the Central Board of Film Certification, the film was denied its approval to release, and was called ‘too lady oriented’ and ‘inappropriate for Indian audience’ - and we know what that means, right? But good for us that the filmmakers didn’t stop fighting for what they believed in. After appealing to the Film Certification Appellate Tribunal, they have managed to get an approval for its release on 21st July with an adult certification. Undoubtedly, with a sincere and super-talented star cast, the movie is all set to break the traditional norms of Bollywood and our society. It’s a gutsy attempt and this trailer is the proof. It will hint you towards all those female voices that are curbed under the pressure of society, name, and fame. And it’ll show you the faces of women that have been forced to exist under an invisibility cloak. After all, female freedom is a gift that EVERY woman wants but it hasn’t been given to her yet and that’s probably why you should watch this trailer.